Who is around President Trump matters much more than with most presidents, because of his impulsiveness, lack of ideology and willingness to make snap decisions. So if you wonder why President Trump has been willing to seriously entertain — and in one case so far, execute — policies that would've been anathema to Campaign Trump, it's partly because of the feedback loop built by Chief of Staff John Kelly and the process adhered to by the national security team before briefing Trump. 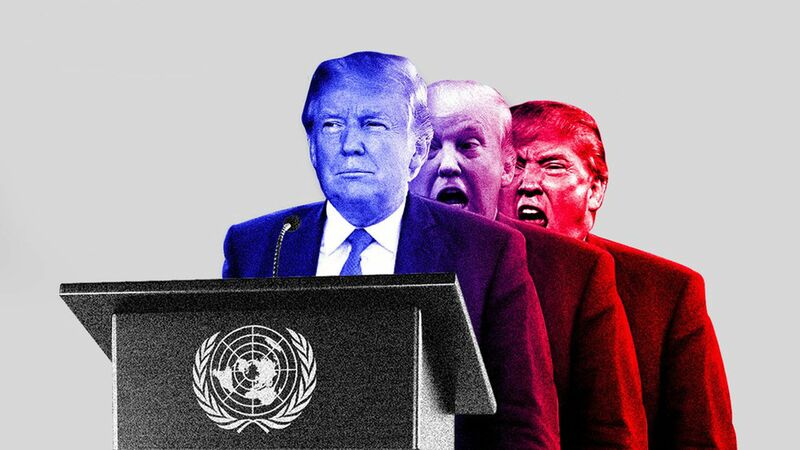 Trump's exposure to populist nationalism is now close to zero, and look for the latest version of Trump to be on display when he speaks to the U.N. General Assembly at 10:30 this morning. Why it matters: Kelly and Staff Secretary Rob Porter pick and choose what information gets to Trump and who's allowed to weigh in, that's supreme power. Trump is totally willing to flip positions — or take an instant stance on a new issue — if presented with compelling evidence in the moment. When Reince Priebus was chief of staff, aides scrambled to get info — usually highly visual — in front of Trump at key decision points, like the time Agriculture Secretary Sonny Perdue brought a map to the Oval to show Trump which states would be hardest hit if he terminated NAFTA. People who know Trump well say it's not so much that he's easily manipulated, but that he trusts Kelly, Porter, Jared Kushner, etc., to be honest brokers. Trump's willingness to publicly entertain an immigration deal that doesn't include funding for the wall would have been unimaginable to Campaign Trump or Travel Ban Trump. No administration official we talked to at the time thought that Trump was being sincere when he originally said he'd be open to staying in the climate deal if more favorable terms were offered to the U.S. On Sunday, Trump officials were on the shows saying exactly that. Trump's decision to raise troop levels in Afghanistan is testament to the power of a unified, controlled info flow to Trump. National Security Adviser McMaster, SecDef Mattis, CIA Director Pompeo, SecState Tillerson, et al. were all on the same page and they kept showing Trump -- with highly detailed and planned presentations -- why it'd be a disaster if he presided over a troop drawdown like Obama in Iraq. Trump's instincts were strongly against adding to troop levels -- he really didn't want to do it. Part of the reason he kept veering was because he had Steve Bannon in his ear: Bannon would circumvent the National Security Council process and go straight to Trump, feeding the president's natural impulses and convincing him that his alternative solution of private contractors was viable. Be smart: Now that Steve Bannon and other circumventers are gone or marginalized, it's easier for the team to shape Trump's perceptions on certain issues. Some Trump decisions — that would have been surprising in the past — are the natural result of the highly controlled information he sees and voices he hears. Trump still has Dan Scavino, the former caddy and Trump Org employee who ran social media on the campaign and now at the White House. If you're wondering why Trump is tweeting a clip of him hitting Hillary Clinton with a golf ball, that's the out-of-hours world in the residence that's still largely Trump's own.